My short story How to Make Love and Not Turn to Stone appears in the new anthology The Beauty of Death. I’m pleased to have this story included in this ambitious project and to be alongside such esteemed writers. I’m particularly pleased to have a chance to read the stories of some writers whose work I have been very excited about as of late, such as John Skipp, Mike Lester, and John Claude Smith. Speaking of John Claude Smith he has written a guest blog post about his story. So here he is welcome John Claude Smith ! On September 30, 2014, my father passed away. Is that any way to begin a blog about my story, “Rotten Apples,” in the new anthology, The Beauty of Death? With honesty at the helm, there really is no other way for me to start this blog post. On September 30, 2014, while I was in Rome, Italy, visiting my girlfriend for the summer, I received an email from my sister letting me know about my father’s passing after months of dealing with cancer. It kicked me hard in the head, the heart. Though it seemed possible he might not make it through my summer in Rome, I hoped for the best and looked forward to seeing him when I was back in the states in mid-October. He had made it this far, I thought he’d make it until I got back, perhaps much longer. Now, I had to adjust my thinking. Now…I would have to deal with grief and huddle with the family as we dealt with the loss. Three days before I was scheduled to get back to California, my mother had a fall and got a concussion. All of a sudden, priorities shifted from the dead to the living in need of help. Yet, I could not let it all go. My first week back in the states, I knew I had to do something to hold on to certain memories and/or aspects of my father that time might whittle to dust. An idea came to me for a story about a family dealing with the aftermath of a father’s death a year after they had buried him in the backyard beneath an apple tree. Jet lag and the knowledge that I would be starting up with work again the following week had me up at 4 a.m. every morning, putting together this tale. In fiction, I will often sprinkle autobiographical elements that I believe enhance a sense of the ‘real’ within the fiction. At least for me, because when I go back and read a story, perhaps that memory will be triggered in the reading, or taken over by the tale; it goes both ways. “Rotten Apples,” originally titled, “Strange Fruit,” took a lot of peripheral memories and sprinkled with abundance. The tale is set in my parents’ house, including the sagging ceiling in the master bedroom that plays a key role in the story. The rollcall of details about the father are full of real incidents my father had discussed with me. Yes, he had worked on Nixon’s plane; yes, he had quit Stanford because he thought himself smarter than all of the professors. Yes, to many things. I added a few (very few, actually) fictional ones, because story demands what it demands. Even the mother has a few characteristics that might relate to my mother, but they’re less defined than what the story takes from my father. There’s even a sequence noting how the father in the tale was not the biological father of the narrator. This element was based on an actual lunch date I’d had with a cousin when I was twenty-five in which she revealed the man I had thought of as my father was not my biological father. In order to distance myself from the truths I’d threaded into the tale, I decided to make the narrator female. This move served to point me in the direction of the weird finale. I thought of these additions about my father as bookmarking memories, in a way. I will always read this tale and know this or that is set in the real world, and this or that is something that might inspire a smile or at least a furrowed brow of curiosity, because my father—the man I knew as my father, at least—was a curious person. Of course, being a writer of weird fiction and horror, all of this information does not lead to a pleasant place. Would my father expect anything else from me? Of course not. Life plays a roll even in the fictional world here, in a tale close to my dark heart. I was ecstatic when “Rotten Apples” finally found a home, so others could share in my strange fictional excursion and join me along my path through grief in the only way I really could deal with it: with Words. 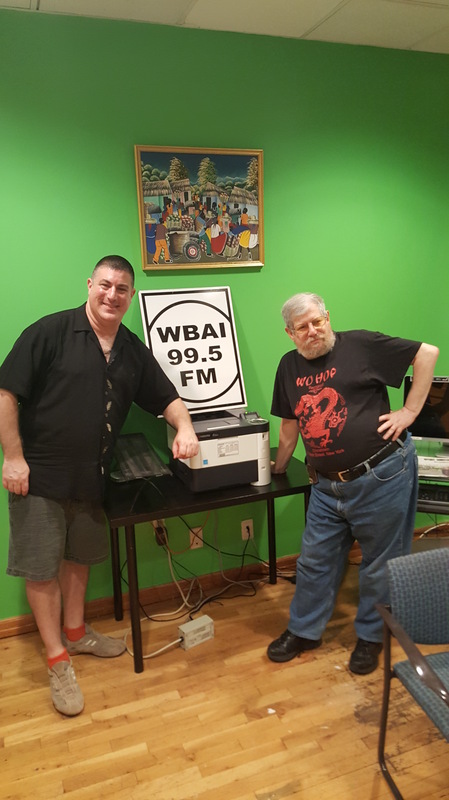 On June 30th 2016 I appeared for the second time on host Jim Freund’s long running The Hour of the Wolf Radio Program. 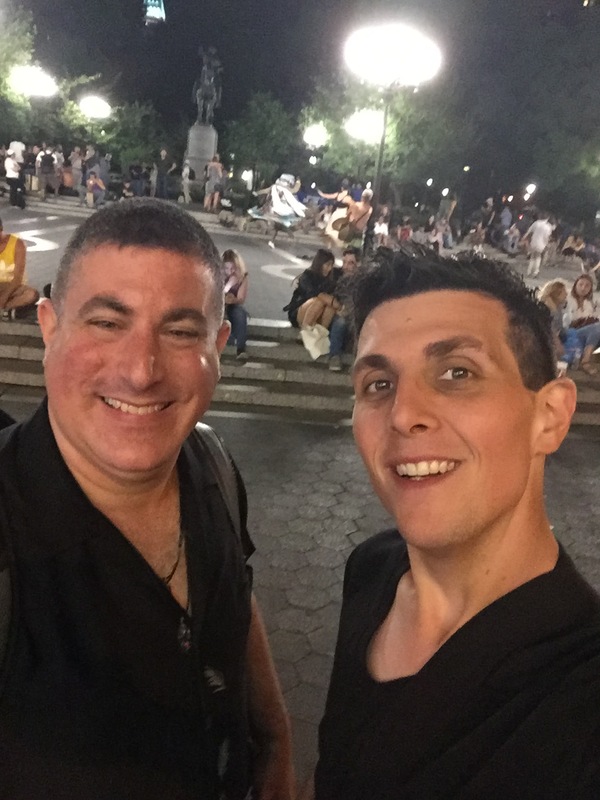 Author Jason Sileo and I went into New York City and worked on fiction late the night of June 30th. We met with our friends some of our favorite writers in New York City. We headed to a rendezvous point and shared excellent conversation with host Jim Fruend. Jim told us tales about some of our many favorite authors he’s had on the show in the decades it has been on the air. 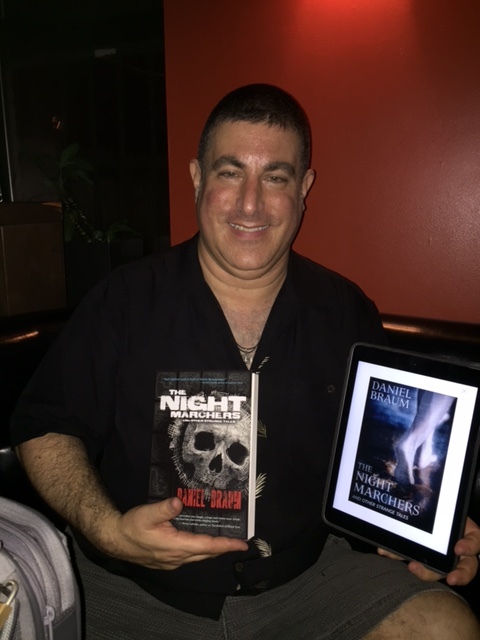 Jason snapped the great photo of me holding the Grey Matter Press trade edition of the Night Marchers and Other Strange Tales side by side with the Cemetery Dance eBook on my tablet. I read the short story The Moon and the Mesa. 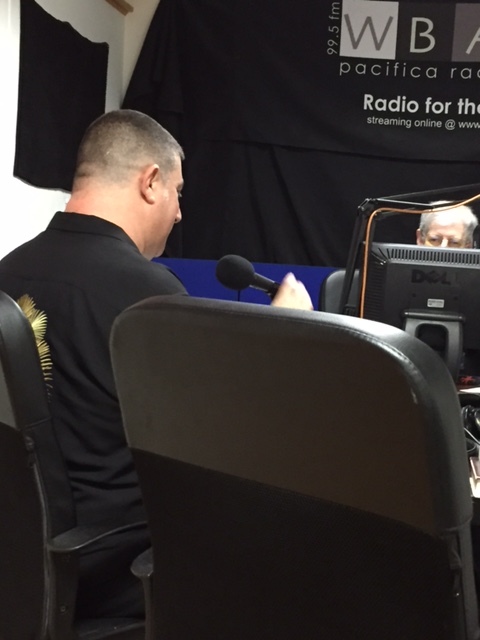 In that last photo you can see the watchful eyes of the host as I read ! Please tune into the link and give the show and the story a listen. It was great being back on Hour of the Wolf. Hope to do it again soon !